We offer our customers a wide range of Reusable Name Badges. Finding application in numerous areas such as hotels, hospitals and offices, our range is highly demanded in the market. 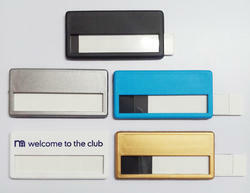 These Name Badges help create a company-wide identification system at an economical price. Our Reusable Name Badges are available at industrial leading price.